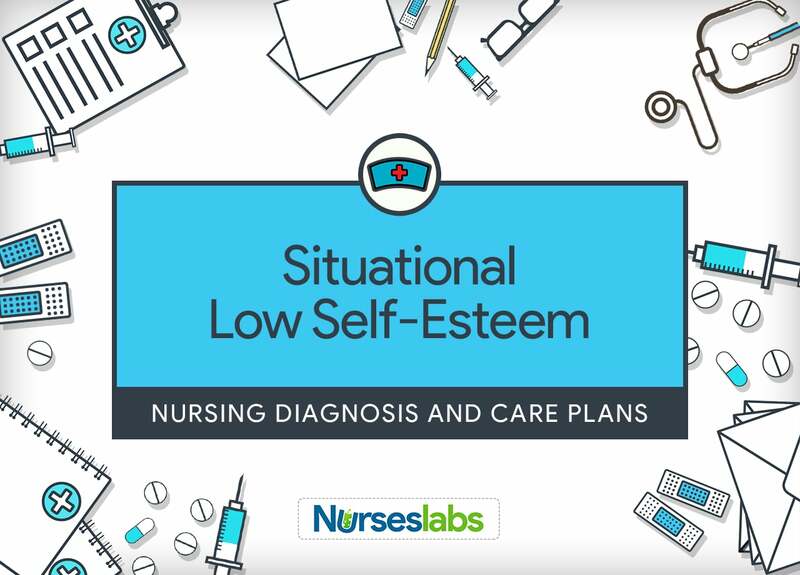 The nursing diagnosis Situational Low Self-Esteem is defined as the development of a negative perception of self-worth in response to current situation. Self-esteem is defined as the way an individual thinks about himself or herself, and how good he or she feels. Positive self-esteem develops when a person feels good and capable of responding to challenges and stressors. Nevertheless, when a person exhibits mild to a remarkable shift in the view of himself or herself such as negativity about self, low self-esteem develops. Low self-esteem can reduce the quality of a person’s life in many different ways, including negative feelings, fear, relationship problems, or low resilience. This change in self-esteem is a temporary phase in response to feeling helpless to control the current situation. A person’s self-esteem is influenced by (and may also influence) his or her ability to function in the society and associate to others within it. Cultural norms, gender, and age are variables that affect how an individual sees himself or herself. Some of the common causes of low self-esteem include unhappy childhood, poor academic performance in school resulting in a lack of confidence, ongoing stressful life events, poor treatment from a partner, parent or carer, ongoing medical problems, or mental illness such as anxiety or depression. These problems can be demoralizing and lead to self-esteem issues. The emotional struggle that patients do to improve self-esteem demands weeks, months, or even years and may require professional guidance beyond the range of the bedside or community nurse. Nurses, due to the nature of the job, have confined and more frequent interactions with patients than other health care professionals. Nursing care can have a huge impact on the patient’s attitude and treatment efficacy. Factors or etiology that may be related to the nursing diagnosis Situational Low Self-Esteem. Tip: You can use the the term “complex factors” in your diagnostic statement if there are too many factors to mention (common in Situational Low Self-Esteem) nursing diagnosis. For example: Situational Low Self-Esteem related to complex factors. Patient reports progress in current situation. Invite the patient to record past and current achievements: emotional, social, interpersonal, intellectual, vocational, and physical. This approach is beneficial in presenting the patient with a more realistic view of his or her capabilities. Patients undergoing situational stress often lose sight of their past accomplishments in handling related circumstances. Welcome statements the patient reveals about himself or herself. The feeling of being unloved, unworthy, and incompetent is often expressed by patients with low self-esteem. The patient often presents himself or herself unable to manage the current situation. Encourage the patient to express if he or she is able to associate these changes to a specific event in his or her life. The patient may be knowledgeable of up-to-date situations that negatively change his or her self-concept. Evaluate the degree to which the patient believes he or she is “in control” of his or her own behavior. Patients may be taken in a vicious cycle of behaviors intended to cover the primary self-esteem dilemma. The acting-out fosters a sense of unworthiness and undermines efforts to esteem-building. Assess the patient’s feelings of comfort and content with his or her own performance. Patients with self-esteem issues may appear as though their actions are not in keeping with their own personal, moral, or ethical values; they may also deny these behaviors, project blame, and rationalize personal failure. Assess for presence of unfinished grief. Ongoing grief may hinder the patient’s ability to move forward in life. Evaluate recent variations in the patient’s behavior. Patients may be able to compensate for low-esteem through exceptional performance in work or areas of special interest while still having dilemmas with how he or she envisions self. Some patients may withdraw from engagement in work or family situations in an attempt to lessen the impact of the situation of self-esteem. Low self-esteem will not be fixed without weighing these issues into the care plan. Evaluate the extent to which the patient feels loved and respected by others. Lack of recognition of achievements or rejection by others may contribute to feelings of unworthiness. Care and support by others will be essential in developing the patient’s self-esteem. Assess how competent patients feel about their ability to perform and carry out their own and others’ expectations. The patient may have developed the ability to carry out personal responsibilities despite low self-esteem. This may be a positive indicator of the patient’s potential for successful improvement of self-esteem. Act as a role model for the patient or significant others in healthy expression of feelings or concerns. Assume responsibility for own thoughts and actions by using “I think” language in conversations. Patients may want an example of positive measures to display feelings. Self-awareness enables the nurse to show authentic behavior. Spend time with the patient; set aside enough time so that the encounter is calm and deliberate. Having enough time for the patient conveys the nurse’s interest in and acceptance of the patient’s feelings. A trusting relationship is an important factor in building self-esteem. Private discussions need to take place in a setting where the patient is free to express feelings without being overheard. Apply active listening and open-ended questions. These communication methods permit the patient to verbalize interests, concerns, worries, and thoughts without interruption. This technique will convey a sense of respect for the patient’s abilities and strengths in addition to recognizing problems and concerns. Consider the “normal” impact of change on self-esteem. Reassure the patient that such modifications often occur in a variety of emotional or behavioral responses. Disturbances in self-esteem are natural responses to important changes. Reconstitution of the patient’s self-esteem occurs as part of the patient’s adjustment to change. Support the patient in his or her attempts to secure autonomy, reality, positive self-esteem, sense of capability, and problem-solving. The patient needs continuous positive feedback and support to manage behaviors to promote self-esteem. The patient will benefit from feedback that provides a realistic appraisal of his or her development and strengthens the effective change made by the patient. Give anticipatory direction to reduce anxiety and fear if interference in self-esteem is an expected part of the process of adjustment to changes in health status. The patient requires a view that places the change in self-esteem within the context of the normal recuperative process. Educate the patient to join in activities anticipated to result in healthy self-esteem. The patient needs to explore options to improve self-esteem by substituting negative behaviors with positive actions. Present referral information about community resources, self-help groups, and professional counseling. Professional and community sources of support provide the patient with more resources to sustain the work of rebuilding positive self-esteem. Educate the patient about the harmful effects of negative self-talk. Recognition of unfavorable thoughts can lift the patient to develop new techniques for coping. The patient must replace negative beliefs and ideas with positive thoughts about self. Urden, L. D., Stacy, K. M., & Lough, M. E. (2006). Thelan’s critical care nursing: diagnosis and management (pp. 918-966). Maryland Heights, MO: Mosby. This is an excellent article. I would like to see some articles posted on the use of transcranial magnetic stimulation (TMS) for treatment of treatment resistant major depression. This treatment has helped thousands of patients, and helped me to get my life back after six years of major depression. I am posting this to promote this treatment and have no affiliation with treatment providers or makers of the equipment used.